While opening a trading position in the "Make deal" window. While setting a pending order ("Pending" type) in the "Orders" window. For already opened position in the "Open positions" tab right-click on the position and select "Position orders" from the opened context menu. For already set order in the "Orders" tab right-click on the order and select "Modify" form the opened context menu. Let us consider a case of a previously opened position. In the "Open positions" tab right-click on the position and select "Position orders" option. 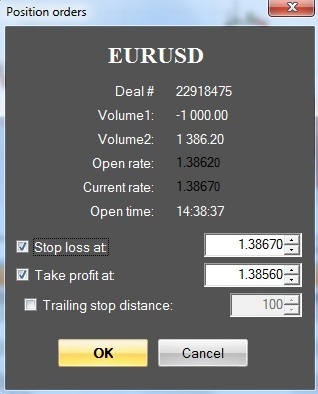 In the opened "Order positions" dialog window you can tick "Stop loss" and "Take profit" check-boxes. You can set both linked orders at the same time. Please, note, that Take profit level should be higher than the current market price for long positions and lower for short positions. Stop loss level should be lower than the current rates for long positions and higher for short positions. 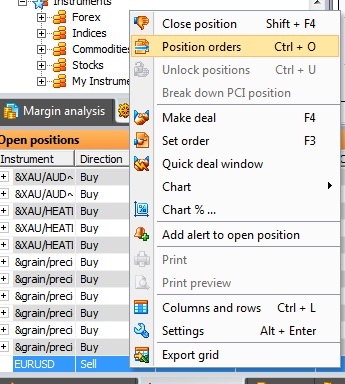 To modify the linked orders for open positions you need to call "Position orders" window from the "Open positions" tab and edit levels of linked orders.